Bugs in the kitchen are quite a big problem, as scurrying in the closet and spoil the products. To get rid of them you need immediately, but that the destruction of these household parasites to be effective, you need to perform multiple incremental action. First you need to find a place where they live -the same hidden area, where they run out. Remember that after the actions against them are taken, it is important to ensure their effectiveness, as even one small egg, left unattended, may lead to new parasites. Basically, bugs are always similar to each other, though their origin is different. There are two types of such kitchen parasites: mukedi and grinders. Those and others are brown and live in the cabinets. That's just the first more like the rump, and the second – wood. If you look closely, you can see that the bugs are slightly different in appearance. Mukedi have a more round shape and dark color, and the grinders – round light-brown color. Those and other bugs always lay their eggs in cereals, books and crevices. To get rid of them necessarily need, only to prepare have to ensure that war is not a joke. How to deal and prevent re-appearance of bugs? For a start, we need to consider more preventive measures. The appearance of such bugs does not depend on how clean the kitchen and the closets, and if stored cereals in special jars, as small parasites always find a way to sneak into the container and spoil the food. Remember that dried fruits and nuts should be stored in the refrigerator, and the cereal before you pour in a sealed container, better to fry a bit. For storage you can take a small cloth bag, which must be boiled in saline solution. You need to carefully inspect the wardrobe and cover up even the smallest cracks. The same will be done with flooring, Windows and window sills (wood). However, if brown beetles have "ruining your life", they need to be exterminated. Spoiled food should be discarded, as they, most likely, the parasites have had time to lay eggs. Don't worry if packs of cereals or flour almost full – health is more expensive and will have to throw away. Then shelves, walls and Cabinet doors should be washed with water and adding chlorine-based products. An alternative solution may be vinegar, dissolved in hot water. Those products that had not yet been opened, or, seem not affected by bugs, you need to lay down separate plastic bags and carry out of the house for 14 days. This time will be sufficient to ensure that these products are not hatched new offspring, which you did not notice earlier. If after two weeks, at least 1 bug appears, the whole package must be discarded. Only getting rid of spoiled food and after disinfection in the kitchen, you can not only get rid of these parasites, but also to prevent their re-emergence. Very often, many Housewives are faced with such unpleasant phenomena as bugs in cereals. Start these small pests, in most cases, due to improper storage. To get rid of them you must immediately after discovery, otherwise they not only spoil the products, but also affect health. After the discovery of bugs in the rump, be sure to check spices, coffee, tea, flour. If you find pests and there, just throw your products, so as to save them will not succeed. All the other bulk products that you have not found the insect, place a couple of days in the freezer, and in the winter, take them outside to the balcony. This procedure is recommended with cereals, just brought from the store. Prepare a sealed jar. Wash them with warm water and soap and dry. After that, pour them cereal, after putting inside cleaned, but not cut a clove of garlic, otherwise it will start rotting, and the products will absorb the odor. Very carefully wash all shelves, cracks and corners in the cabinets in which to store dry foods, warm water with soda or soap. Then wipe everything with a weak solution of vinegar and wait till the cupboard is ventilated and dry. On the shelves lay dry lavender flowers, Bay leaves or garlic cloves. At the time of purchase of cereals in the store, inspect the package and contents. In most cases, your products come into the kitchen with the shelves. Try to buy products as needed and do large stocks. Remember to store cereals in sealed jars for a long period of time is not recommended, as they may lose nutrients. It is advisable to throw away the infected cereals. To prevent bugs, before falling asleep cereals in banks, you need to bake them in the oven or in a frying pan. On the bottom of cans it's recommended to put lemon peel, gauze bags filled with salt or garlic. Surely every housewife in the kitchen has a supply of flour and various cereals. But all grain products have a shelf-life. At elevated temperature and humidity (ideal conditions for infection of cereals), flour can be got a variety of pests: corn borer, granary weevil or flour castaneum. So how do you get rid of flour bugs? Even if you have in the cupboards by the order in the flour and cereals can still live bugs. They can easily be put in the house with already infected grains. The first thing you need to extract all packages and containers of cereal and carefully examine. Upon detection of insect infested flour or groats is immediately thrown away. Many are trying to save their stocks, procalis them in a pan or sift through a sieve. This is not an option, because the small larvae pass through the sieve and remain in the flour, where in the future start to develop. In addition, there is the possibility of Contracting a nasty infection, so do not feel sorry for them – feel free to throw. Pour in a bowl of hot water and thoroughly wash all cabinets with the use of vinegar, Domestos or other disinfectant. Repeat this procedure several times, so you will be able to destroy all insects. Uninfected flour and other cereals pour in a new compact package and remove for a couple of weeks in a cool place – a fridge or a balcony. After this time, open the bags and make sure no flour bugs. Now you can pour the flour into another, more robust container with a lid. If you keep the flour cloth bags, it does not hurt them to chew through the cloth and get into a favorite treat. But if you have a bag pre-treated with a strong solution of common salt, it will be available for voracious beetles. Insect repellent put it in a bag of flour, several cloves of peeled garlic, and cereals in small bags of salt. For weevil and other pests of cereal products, prepare the following mixture: take and mix equal proportions of powdered sugar and borax and powdered in a coffee grinder millet. Roll the mixture into small balls and place in every corner in the cafeteria. Should take into account that insects will not die immediately, so make this dressing several times. To prevent flour weevils lay in a cupboard for cereals, Bay leaves or slices of lemon, their pungent smell will help to deter these malicious insects. Also help band-aid or adhesive tape with double side adhesive glued on the inner side of the Cabinet to which you want to pour nutmeg. Insects infest products, if you bought in the store or on the market of the infested cereals or flour. Bugs can chew through plastic bags and settle in other products: flour, dried fruit, tea, spices. If this happens, take the following measures. Examine very carefully all your supplies cereals, pasta, crackers, flour, dried fruits, spices. Bugs can also wind up in the sugar, tea and cocoa. Throw away all products where insects are detected. Eating them is impossible, even if you bake the cereal in the oven. Place for 24-48 hours in the freezer products in bulk in which insects are not detected. The only way to be sure that they will appear new bugs from larvae and eggs which you have not noticed by visual inspection of grain. Do a thorough cleaning in the kitchen. Remove contents of kitchen cabinets. Rinse them thoroughly inside and outside with warm water and disinfectant. It is suitable vinegar essence, you can use a solution of Domestos. Wipe kitchen cupboards, dry them, preferably during the day. Cover the Newspapers shelves where to store cereals. People say that printing ink repels bugs. Put in cabinets, Bay leaf, cloves of garlic. You can use dry lavender flowers. Buy new products in the store in small quantities. Pour them in a sealed container. For reinsurance purchased grain can be put on a night in the freezer of the refrigerator. As folk remedies you can try to put in the jars with dry food aluminum spoon. The excrement of the bugs found in cereal, hazardous to health, so the products contaminated with insects should be discarded. Carefully check cereals with their purchase in the store or on the market. Do not buy them in store in large quantity. Observe the terms and conditions of storage products. The appearance of black bugs in the house is a rather unpleasant event. You can see them on the bookshelves, in cracks of walls and even in flour and cereals. To get rid of uninvited guests, you need to start a fight with them as early as possible. The appearance of black bugs in the house suggests the need for a thorough General cleaning. This is because insects need to eat, and they eat skin particles, dust, fabrics, cereals and flour. Banks with cereals or dark shelves may appear small larvae, which then turn into beetles measuring up to 2 cm. these insects are called flour chromacake. Sometimes in homes can appear larger instances called small hromakey. Small insects have a reddish color, large – pure black. In the initial stages of the resettlement of black bugs in the apartment or home will be enough to get rid of spoiled grains or flour, to wash containers for storage and shelves with detergent. The control of insects in wooden houses is complicated by the fact that they can lay their larvae in the smallest crevices of the walls. In order to eradicate uninvited guests from your house, you need to approach this in a comprehensive manner. Be sure to wet cleaning with the use of potassium permanganate or detergent. You need to check all the cereals and flour for the presence of infection. In addition, it is necessary to take special measures to prevent the emergence of new insects. 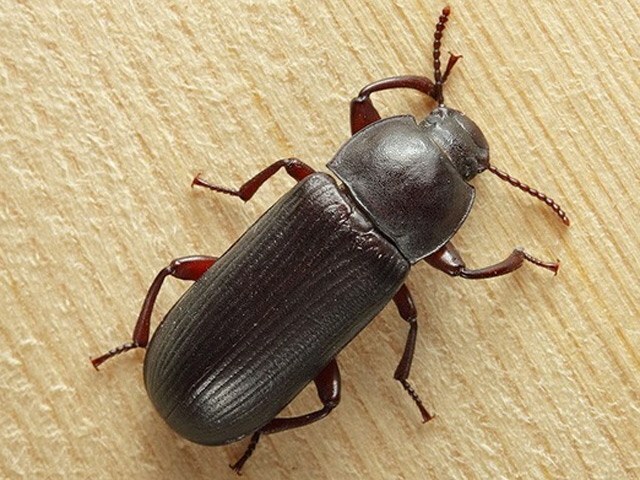 The emergence of a new wave of black beetles occurs in 2-3 weeks. This is due to the fact that so much time is spent on the transformation of the larva into an adult. So cleaning does not need to be postponed until a chance to destroy the immature insects. Sift flour contaminated does not make sense, because eggs have such small sizes that do not linger even at the shallow sieve. In addition, they are impossible to see because the color blends with cereals. In the vernacular they are called chromacake-deceivers. Due to the small size, insects easily find their hiding places. The prevention of access to flour and cereals does not exclude the possibility of switching to other foods. 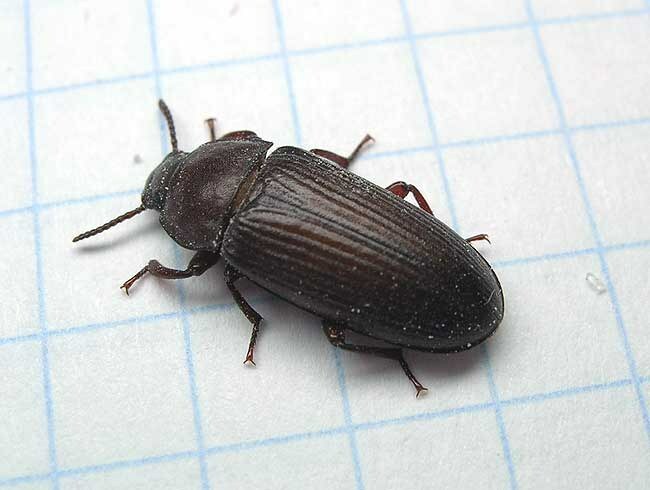 Large, black beetles can be observed in the bookcases. They can leave their larvae in dry dusty corners. To protect fresh products from attack by insects, they need to freeze in the refrigerator for about a day or bake in the oven. Shelves, inhabited by black beetles, should be washed with vinegar and baking soda. After that it is recommended to treat them dichlorvos and rinsed again with detergent. 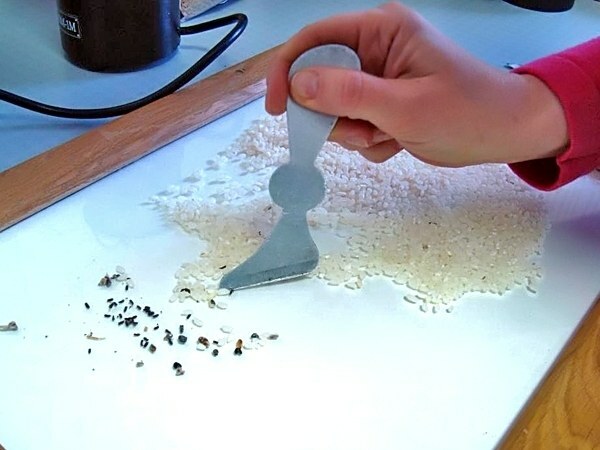 Help to get rid of insects the garlic left in the tank of cereal. You can experiment with lavender small. Cotton pads it is necessary to moisten them and leave on the shelves. However, here we need to be prepared for the fact that the barley can absorb the smell of lavender. Bugs in flour, cereals, certain other products may become damaged due to improper storage, but they can sneak in with the purchased products. The presence of these intruders in itself is unpleasant, the quality of the products contaminated with insects, inevitably decreases, and if the pests managed to breed, to get rid of them, only throwing all products with signs of infection and to arrange the General cleaning. It is much easier to prevent the appearance of insects in your kitchen. Known folk remedy that can help deter pests from stocks of cereals and flour – the usual garlic. Put in the container with dry food in the cloves of unpeeled garlic. Cut the garlic does not need a whole less effective, but groats and meal, will not exude an odor. Deterrent effect is also a Bay leaf, a piece of dried lemon peel. Another popular way to protect products from bugs – to put in a container a piece of thick steel wire or a large nail. Wash them before putting them in the rump not need to do not started to rust, good enough to wipe with a dry cloth. In the pic you can put a pod of red hot pepper – it not only allow you to wind up in the rump bugs, but will help to avoid unpleasant characteristic smell, appearing in rice during prolonged storage. Keep flour and cereals in glass or plastic containers with tight-fitting or screw-on lids. 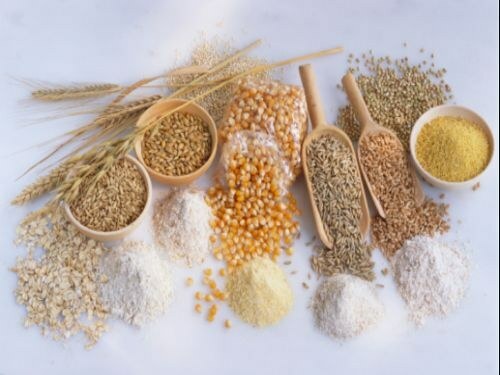 If you are doing large reserves of flour and cereals, if possible, store the main stock in a dry cool place, sprinkling a little in the tank for everyday use for the consumption. 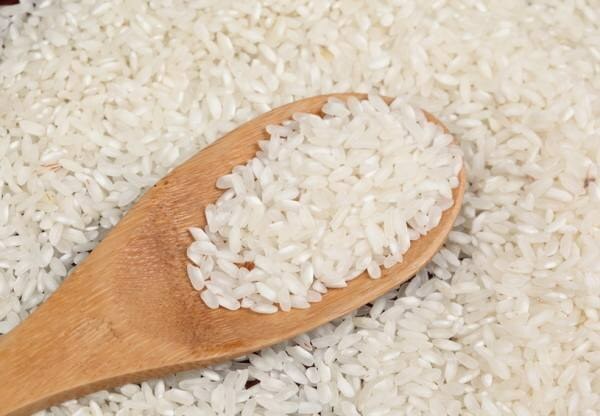 If you prefer to store the flour and rice in canvas bags, before you pour in them food, water pouches in saline solution and air dry, do not propulsive. Most often the bugs get into the house together with barley and flour, purchased from vendors, lack of accountability related to storage conditions of products, or purchased in bulk. Also insects can get in the bags and paper or plastic bags from other foods stored nearby – for example, open containers of dried fruit or starch. If you purchase rice and wheat or rye flour in bulk, carefully inspect the products in the pic you notice the small larvae, and the flour can be small lumps, inside of which are pupae of insects. If you suspect that you have already purchased the products are contaminated, place of packaging, without opening, for a day in the freezer, and only after that precipice in the prepared container. Rice is thoroughly rinsed and then dried. Flour before storing, carefully screening through a fine sieve. Warm the food in the oven is possible only at low temperature, otherwise you will suffer the quality of the products. Regularly clean the place where you store cereals and flour, mimetite leaked products, and after wet cleaning wipe interior surface of kitchen cabinets and tables with vinegar soaked cloth and dry before placing inside of packages and containers of food. Never add cereals and flour in the tank without first washing them with hot water.